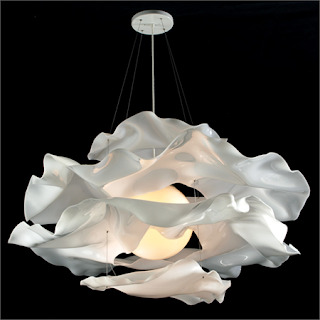 While on the subject of lighting I thought I would share some chandeliers that have been inspiring me lately. I've been interested in lighting because I am dying to replace the fixture that is above our dining room. It's tragic, it's awful, I'm embarassed to show it to you. But I will since I know you won't laugh; too hard. Seriously, who puts a ceiling fan above the dining room table? If you had it on all your food would get cold. It's not even a nice ceiling fan. Our vintage house who has had a lot of owners so who knows who installed it. I think about changing it a lot. So as usual I've been perusing websites looking for lighting inspiration. 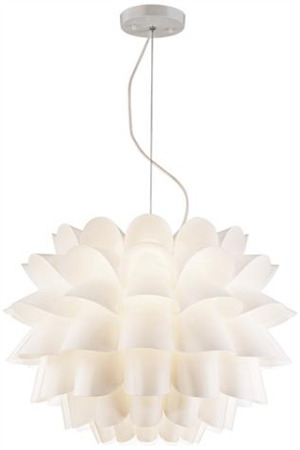 Love this classic Possini White Flower Pendant light. It can work in so many spaces. Oooohh, look at this! 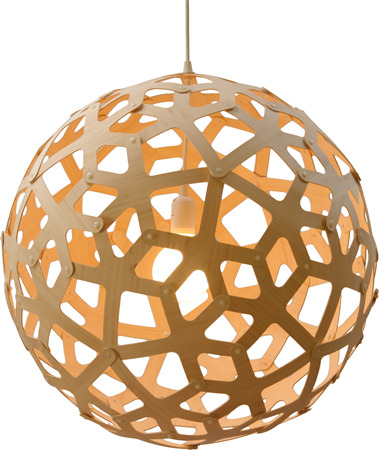 Its the Coral Pendant from David Trubridge Co. I wonder how difficult it would be to try and make this from wood veneer. You could cut it out with an Exacto then fasten the pieces together. Might take forever, but might be worth it! 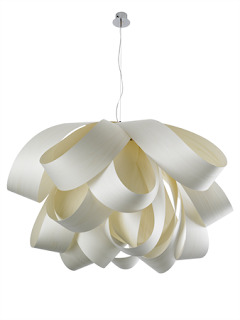 Speaking of wood veneer, check out this little beauty from lzf-lamps. It's the Agatha pendant. it seems like you can buy some wood veneer, cut strips and drape them around a bulb. I also like this Cloud Pendant from Fire Farm lighting. It's made of acrylic so I'm not sure how I would try to make it myself- it's nice to look at though. 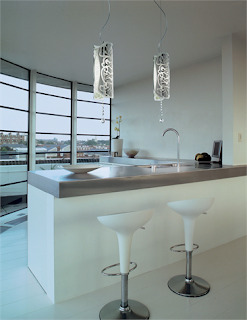 These lights are from the Charm collection from Gallery. 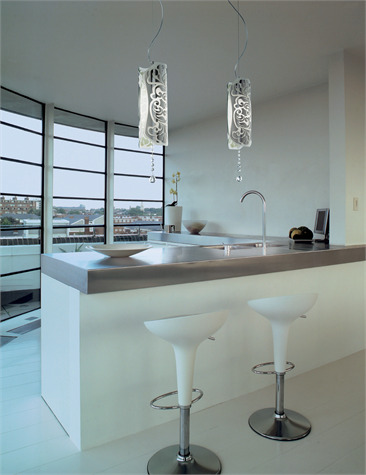 You can find it at Leucos USA or try making one of your own. 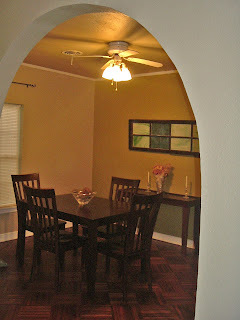 The designer ones are etched glass, but you can get a similar look with vinyl or frosted glass spray. I threw this little guy in for fun. 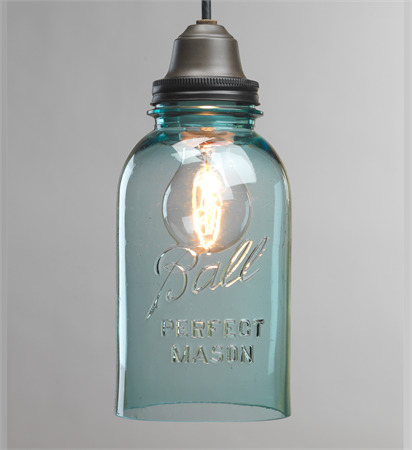 I've loved seeing all the mason jar lights I've seen around like this one at Kara Paslay or this one at 3 Sunkissed Boys. I'd love to make one of these myself one day. Ps: I'm in love with the Agatha light and the cloud and Ball jar lights aren't bad either. Oh, Rachelle! I feel your pain. I have those all around my house. EVERY bedroom, the living, and family room. South florida is very hot so we do need the fans but good lord they ones we have are UGLY! One day I'll replace them. I love the Cloud Pendant. I wonder if the Agatha pendent can be recreated with another type of material perhaps? Hmmm! BTW, Kara Paslay also sells the mason jar chandellier. I bought one from her (that I've yet to install) because I was too chicken to tackle that project. The Ball jar is my favorite, for sure! So cute!!!!! !